Have you ever met or worked with someone who is so inspiring in both their life and work that when you are with them or reading about them you find yourself uplifted with a feeling of renewed energy? These are the people who not only turn our focus to important issues, but also shine a light onto possible solutions, creating paths forward, and inspiring the community into action. These are exceptional role models that should be nominated for The Center's Changemaker Award. You can now do just that - nominate an individual or an organization that has made a difference in the world of healthcare facility design for the Changemaker Award. Given annually by The Center for Health Design's Board of Directors at Healthcare Design Expo & Conference, this award honors individuals or organizations that have demonstrated an exceptional ability to change the way healthcare facilities are designed and built, and whose work has a broad impact on the advancement of healthcare design. To recognize for an individual or organization that has changed the way healthcare facilities are designed and built, and whose work had a broad impact on the advancement of healthcare design. To give the potential recipient an opportunity to share lessons learned about changing the healthcare design industry with colleagues at the annual Healthcare Design Expo & Conference. To inspire the healthcare industry to create the best possible healthcare environments. Past honorees read like a "Who's Who" in our community. To read more about the award and to submit a nomination before February 28, click here. Informal communication between clinical and nonclinical emergency department (ED) staff is a necessary component of collaborative care and, according to a recent study, spatial layouts have an effect on how that communication takes place. The “Influence of Spatial Design on Team Communication in Hospital Emergency Departments” study, which was published in the Health Environments Research & Design Journal, involved two health systems, each with two EDs for a total of four study sites. Bernice Redley, R.N., Ph.D., faculty of health, school of nursing and midwifery at Deakin University, lead author of the study, says two of the sites had been redeveloped into EDs, while the other two were purpose-built greenfield sites. They also provided a mix of environmental layouts, such as a traditional square corridor or a pod-style layout. All were set in busy, metropolitan areas. While funding, utilization rates and strategies for growth vary across the heath industry, a growing cohort of healthcare clients in the Middle East, Asia and India are benchmarking with leading healthcare institutions in North America, Western Europe and Australia. Clients with facilities in these areas historically had a narrow focus to address “the big three” of shortages: beds, skilled clinical staff and medical technologies. Today the confluence of a progressively competitive marketplace and globalization is resulting in an increasing number of discerning patients and providers seeking value from health systems in these international geographies. The industry is experiencing a shift as global clients with facilities in these nations are instructing healthcare designers to place equal emphasis on patient experience, clinical care, quality, safety and revenue capture. Medical Construction & Design, more. . . In rural and suburban areas, hospitals tend to build on low-density tracts where land is relatively cheap and additional land is available for expansion. Infrastructure has to be extended to these remote sites that lack adjacent housing, amenities or public transit, and staff has to commute to work rather than live nearby. New or expanded hospitals often require significant public support to open their doors. In denser urban areas, hospitals can quickly become landlocked as they grow. Medical Construction & Design, more . . . In this webinar, Jonas Shultz, MsC, EDAC, with the Health Quality Council of Alberta, provides an overview of a systems approach to enhance medication safety using Human Factors strategies. He highlights various considerations, evaluation strategies, and previously completed projects, which aim to optimize tasks being performed, information and equipment used, and the design of environments for individuals involved in the medication use process. Research Corners provide the chance to interact with authors who have recently published evidence-based design papers and articles in peer-reviewed journals. Attendees will be able to interact with the author(s) as they discuss their study and provide ways to translate the research into practice. Join us as Arsalan Gharaveis, Ph.D., MARC, ASSOCI. AIA, EDAC, Assistant Professor of Interior Design, Southeast Missouri State University, and Kirk Hamilton, PhD, FAIA, FACHA, EDAC, Julie & Craig Beale Endowed Professor of Health Facility Design, Center for Health Systems & Design at Texas A&M University explore their study that examines the influence of visibility on teamwork, collaborative communication, and security issues in emergency departments (EDs). This research explored whether with high visibility in EDs, teamwork and collaborative communication can be improved while the security issues will be reduced. With support from the Kresge Foundation, The Center for Health Design has developed a standardized Community Health Center Facility Evaluation tool that supports design for population health. The tool is intended to support both design and post-occupancy evaluation of built projects with respect to population health goals. 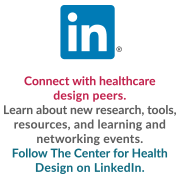 A complete, user-friendly library of healthcare design resources that continues to grow with the latest research, start with our Knowledge Repository for all of your searches for articles and research citations on healthcare design topics.